Latvian specmachin, Mexican empanadas, Uzbek samosa and Italian calzones – these and hundreds of other pies of puff, sweet, yeast and unleavened dough with various fillings baked in the oven. Each of the cakes has its own peculiarities of preparation, but there are General rules about how to bake pies in the oven. Reisa temperature 15-20 minutes before ready to put the pies in the oven, you have to turn it on and heat to the desired temperature. The General rule is – if you bake crispy, the temperature should be high, if you are interested in fluffy soft dough, you have to stick to the average temperature. Usually the temperature regime is specified in the recipe, in degrees Celsius (C) or Fahrenheit (F), if it's a recipe in a foreign language. O°C is 32°F, each degree Fahrenheit equal to 5/9 of a degree Celsius. If you don't like long mathematical calculations, use a calculator on the Internet. For example, like this: fahrenheit-celsius.info. If the recipe doesn't specify the exact temperature, but it is written that to bake cakes you need in a heated oven, means that you'll have it heated up to 200-220°C. the Hot oven is 240-250°C, average temperature or moderate heat is 175-190°C and a low of 140 to 150°C. If this is one of your first experiences with the test, don't choose a recipe that omits such an important detail. It happens that the thermometer in the oven is broken or absent initially. In this case, conduct a simple test. Take a piece of baking paper and let's see when he will change from white to Golden. It takes 30 seconds, if in the furnace of intense heat, a minute, if the temperature is high, a minute and a half at moderate temperatures, and three minutes if in the oven low temperature. 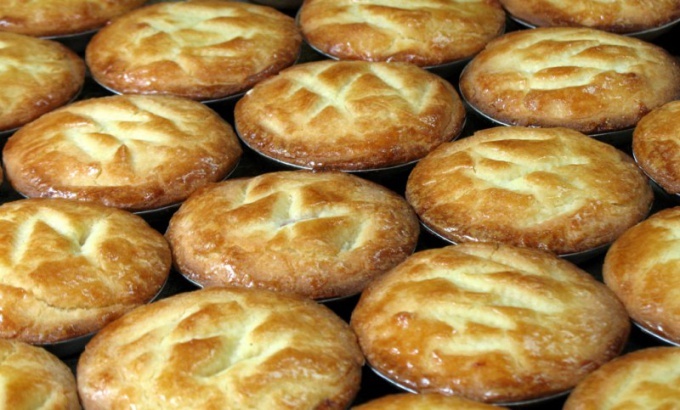 Heat in the oven rises, so pies from fancy pastry with a high content of oil or fat, put closer to the middle or slightly below, the fat did not melt too quickly. Vegetable pies need to put a little higher. If your oven is heated unevenly – one side of the patties ready and the other is still raw, buy baking stone. He is able to accumulate and distribute the heat. If oven does not warm up to the desired temperature, some home craftsmen simply set in the oven a few clay bricks accumulate heat and increase the heat. Breakroomlive pies are baked faster than the large. Yeast dough products generally require more time to prepare than flaky. The easiest way not only to comply with the time specified by the author of the recipe, but watch out for the pastries through the glass. Usually about the readiness of the pies clearly shows a Golden brown colour. Oborudovaniia to bake cakes and pies, perfect pans of heat-resistant glass. They well accumulate heat and you can monitor the readiness of pies, not only paying attention to their top, but also to see whether they are cooked on the bottom. Stones for baking ideal for preparing of products from dough, as they immediately give off heat, helping the cakes to "rise". Their first porous structure absorbs moisture and then releases it, that does not test neither spread nor burn. If you bake in an ordinary pan, use Baker's parchment. It is not necessary to grease a. Pies, as a rule, it do not burn, and the pan after baking it will be enough just to rinse.